IBM® MessageSight is an appliance-based messaging server that is optimized to address the massive scale requirements of machine-to-machine (m2m) and mobile user scenarios. IBM MessageSight makes it easy to connect mobile customers to your existing messaging enterprise system, enabling a substantial number of remote clients to be concurrently connected. The MQTT protocol is a lightweight messaging protocol that uses publish/subscribe architecture to deliver messages over low bandwidth or unreliable networks. A publish/subscribe architecture works well for HTML5, native, and hybrid mobile applications by removing the wait time of a request/response model. This creates a better, richer user experience. The MQTT protocol is simple, which results in a client library with a low footprint. MQTT was proposed as an Organization for the Advancement of Structured Information Standards (OASIS) standard. This book provides information about version 3.1 of the MQTT specification. 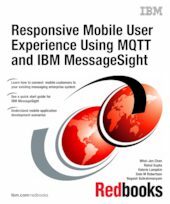 This IBM Redbooks® publication provides information about how IBM MessageSight, in combination with MQTT, facilitates the expansion of enterprise systems to include mobile devices and m2m communications. This book also outlines how to connect IBM MessageSight to an existing infrastructure, either through the use of IBM WebSphere® MQ connectivity or the IBM Integration Bus (formerly known as WebSphere Message Broker). This book describes IBM MessageSight product features and facilities that are relevant to technical personnel, such as system architects, to help them make informed design decisions regarding the integration of the messaging appliance into their enterprise architecture. Using a scenario-based approach, you learn how to develop a mobile application, and how to integrate IBM MessageSight with other IBM products. This publication is intended to be of use to a wide-ranging audience.